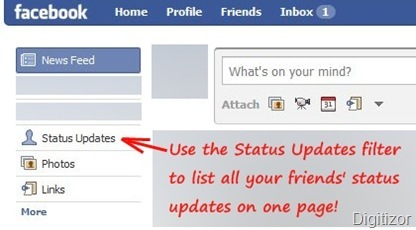 Facebook Tip: View the status message updates of all your friends in one single page? Facebook’s Status Message feature has now become one of the most convenient ways of communicating a message online to many. Everyone who is on Facebook uses the Status Message feature to notify about their current state like where they are, what they are doing, when they are free, etc. In this article we will tell you how to view the status messages of all your friends in one single page. The New Facebook has a very nifty feature called Application Filter which appears on the top left of all pages of your facebook account such as your profile page and the Facebook home page. Among these filters, one filter is a “Status Updates” filter. When you click on that filter, the status messages of all your Facebook friends will load in that page. You can check the screenshot below to find out about the status updates filter.